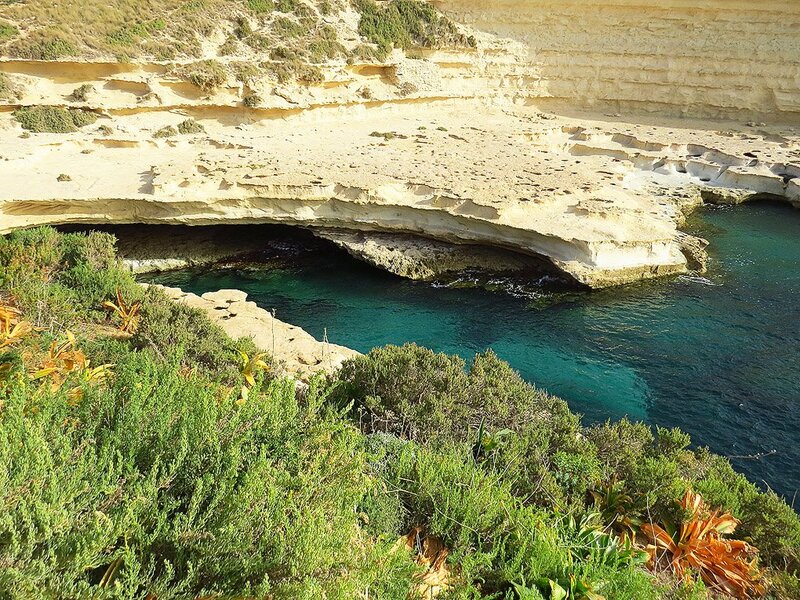 Though Malta’s finest sandy beaches are restricted to the north and west of the island, arguably the best rocky swimming spots are on the eastern, opposite side. 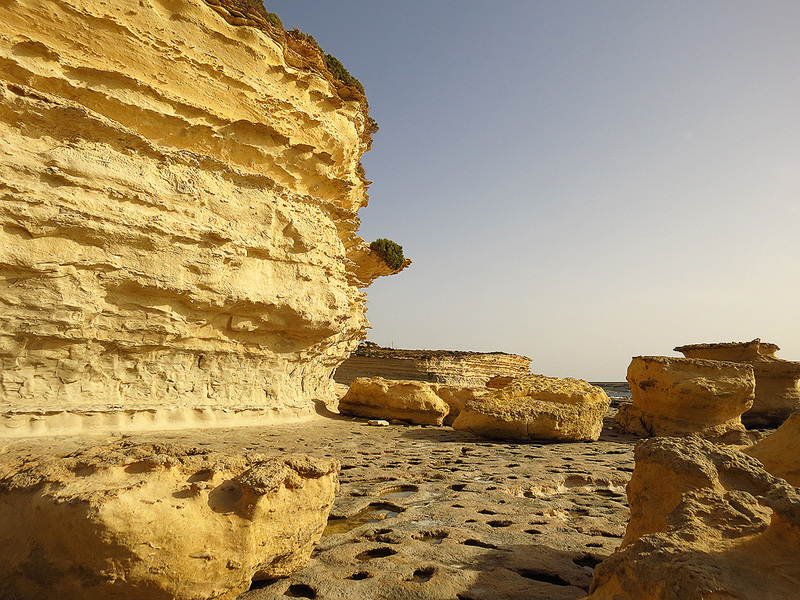 The Delimara promontory next to the fishing village of Marsaxlokk arguably boasts the cream of the crop with some beautiful rocky inlets and some wonderful rock formations. At the furthest end of Delimara one finds the small bay known locally as Il-Kalanka, located just short of the iconic Delimara lighthouse built by the British in 1855 and now fully restored though no longer in use. The lighthouse offers superb vistas over the busy multi-use port of Marsaxlokk – a port which hosts Malta’s largest fishing fleet at the village of Marsaxlokk at one end while the other, further end is taken up by the gantry cranes and container vessels of the Malta Freeport in Birzebbuga. Il-Kalanka is mostly a quiet bay on most summer days, though it gets busier on weekends. There are no permanent facilities in the bay – the restaurant which once graced the bay is now in disrepair, though there are plans for its reopening. The next bay in Delimara is Peter’s Pool. The curious and rather un-Maltese name itself was coined by the British and has stuck. Though somewhat similar to Il-Kalanka, Peter’s Pool is however completely free of buildings and is slightly harder to locate. The path leading to it is just past a house called L-Gharix. This (private) house itself is of some interest as it was former Maltese premier Dom Mintoff’s (1916-2012) personal and favourite dwelling. In fact for a long time and just up to a few years before his death the ex-prime minister could be said to be a common sight at Peter’s Pool as he swam there regularly and all year round. The wintertime swimming no doubt lent to his cultivated strongman image… On the outer edge of Peter’s Pool are some fantastic rock formations and scattered boulders – always a quieter area than the bay itself and actually offering a modicum of shade on hotter summer days. A third bay is some way off the two already mentioned. Xrobb il-Ghagin is reached from a side road near the Tas-Silg Battery on the Delimara road and is located next to what was once a relay station for Deutsce Welle but has now been given a new lease of life as the Xrobb l-Ghagin Nature Park. This is a wide bay with a natural arch at its furthest end. 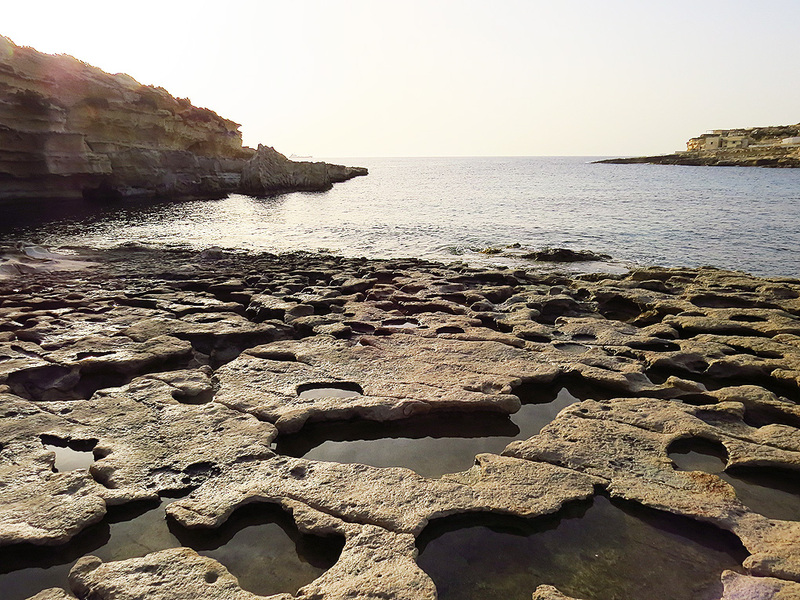 Common to all three rocky beaches is clean bathing water, good diving and snorkelling opportunities and – at least in the less hot parts of the day – an invitation to further explore this lovely, dramatic part of the Maltese coastline, dotted here and there with salt pans which are still worked to this day.